New Book Provides Revolutionary Decipherment of Script, Links Between African Tribes and Ancient Minoans Monday December 18, 12:35 pm ET CHRISTCHURCH, New Zealand, Dec. 18 /PRNewswire/ -- In a groundbreaking new work by Graham Campbell-Dunn, "Who Were the Minoans? An African Answer" (now available through AuthorHouse), he presents an in-depth assessment of the origins of the Minoans of prehistoric Crete, solving a mystery that has lingered for more than 100 years. His application of archaeology, anthropology, comparative linguistics and genetics leads to the nomadic Fulani and Yoruba tribes of Africa. One of Campbell-Dunn's greatest breakthroughs comes in his research about the origins of Minoan language. "Who Were the Minoans?" is a landmark in the history of classical scholarship in that it translates a portion of the Minoan Linear A documents. From vowel harmony to Niger-Congo prefixes, the similarities in Minoan speech and writing and those of Africa are numerous and convincing. Campbell-Dunn also offers an overwhelming abundance of evidence that points to the Crete-Africa link. For example, the Minoans kept cattle and have red-toned skin like the Fulani herdsman. Their palaces, like the Yoruba, have a main courtyard which is also used as a market. Their double axe is also a symbol of the Yoruba storm god, and Minoan art, with its range of primary colors and decoration based on snakes and cut calabashes, uses numerous symbols of African subject matter. Their male garment, the codpiece, is African. 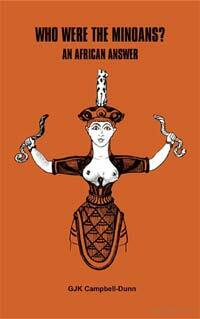 Even their religious worship links Africa to the peoples of Crete: African fertility cults and their worship of the snake goddess Minona are the basis for the Minoan belief system. "Who Were the Minoans?" is a fascinating glimpse not only into the previously unknown beginnings of prehistoric Minoans, but also the Bronze Age's fashion, religion, sexuality, trade, warfare, sport and entertainment. A work that appeals to scholars for its research breakthroughs, it is also a captivating read for any history lover with its portrayal of the lively way of life of both the African tribes and the Mediterranean Minoans. Campbell-Dunn was awarded his master's degree in classics with first class honors by the University of New Zealand and went to the University of Cambridge on a postgraduate scholarship. There he studied classical philology under W.S. Allen and R.G. Coleman and was privileged to be taught by John Chadwick who worked on Linear B (Mycenaean Greek). His training also included general linguistics with John Lyons and classical archaeology with R.M. Cook and Hugh Plommer, the architectural historian. He later taught classics and ancient art at university level in New Zealand and completed a Ph.D. on Herodotus, the Greek historian and anthropologist. For the last 10 years he has devoted his retirement to researching Niger-Congo linguistics, art and anthropology. Campbell-Dunn has previously completed eight academic books on classical studies.